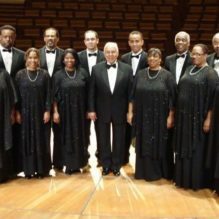 The Albert McNeil Jubilee Singers, a traveling company of 12 to 18 and a resident group of 29, have garnered international acclaim and focused worldwide attention on the vast body of folk music termed "African-American." In 1968 the Singers undertook their first European tour. Today, after 18 sold-out European tours, 12 tours of the United States and Canada, tours of the Middle and Far East, Africa and South America, they are among the most honored singing ensembles in the world. They were selected three times to serve the U.S. State Department and USIS Cultural Exchange Program in areas of the world, known in those days as "behind the Iron Curtain," including East Germany, Hungary, Romania, Poland, Czechoslovakia, Yugoslavia, Iran, India, North and West Africa, Egypt, and the United Arab Emirates. Founder-Director Albert McNeil is well-known to the national choral community, having been honored on four occasions with "Command Performances" before the prestigious American Choral Directors Association in 1981 in New Orleans, in 1985 at their Salt Lake City convention at their convention and their 1997 convention in San Diego, California at Los Angles during the ACDA Western Division Convention held on the campus of Loyola-Marymount University campus. The Jubilee Singers were invited to sing for Pope John Paul II during his visit to the singers’ home-base Los Angeles in 1987. Of signal importance in March 2010, the Jubilees made their debut in the Avery Fisher Hall Lincoln Center, New York before a capacity audience, and returned to be headliners are the Mark Thallander Annual Choral Festival in the Cathedral of the Angels downtown Los Angeles. On Sunday January 30, 2011, the Jubilee Singers presented the west coast performance of Linda Twine's cantata "Changed My Name", the dramatic story of the lives of Harriet Tubman, and Sojourner Truth. In January 2012, the singers joined soprano, Kathleen Battle (at UCLA's Royce Hall) in an evening of Spirituals. Also, the Jubilee Singers performed as headliners in the Jalisco Canta choral festival in Guadalajara, Mexico. During 2013 the singers joined the South Bay Children's Choir in a program of American folk music at Marsee Auditorium, El Camino College. "Changed My Name", a cantata by Linda Twine, was repeated in concert at the First Presbyterian Church of Pasadena. October the singers presented a workshop of music from the African Diaspora at University Southern California. The Hour of Power, a well known television program covering much of the of the English speaking world, featured the Jubilee Singers at the program's new location Shepherds Grove church: this was a part of their pre-Christmas programming.